Andy Winbow, Assistant Secretary-General and Director, Maritime Safety Division, International Maritime Organization (IMO) – on mission in Baha Blanca, Argentina, 2013. United Nations Secretary-General Ban Ki moon has welcomed the steps agreed upon today by the members of the International Maritime Organization (IMO) to address greenhouse gas emissions from international shipping. According to a statement issued by Mr. Ban's spokesperson, the steps include: efforts to limit sulphur emissions; a mandatory data system for fuel consumption; strengthened implementation of energy-efficiency regulations; and a road map for developing by 2023 a comprehensive IMO strategy on reduction of greenhouse gas emissions from ships. “Welcoming these important steps, the Secretary-General calls for urgent and ambitious action to limit the greenhouse gas emissions from global shipping [which] are projected to rise significantly given the critical role that shipping plays in the global economy,” said the statement. Further to the statement, Mr. Ban called on IMO members, in partnership with the maritime industry, to promote further progress on the reduction of greenhouse gas emissions from ships to contribute to the objective of the Paris Agreement on climate change, which enters into force on 4 November 2016. For its part, the IMO, which, as a specialized UN agency, is the global standard-setting authority for the safety, security and environmental performance of international shipping, called the new mandatory requirements important milestone on the road to controlling greenhouse gas emissions from international shipping. The requirements were adopted by the IMO's Marine Environment Protection Committee, (MEPC) meeting in London for its 70th session (24-28 October). IMO Secretary-General Kitack Lim said the new requirements sent a clear signal that IMO was ready to build on the existing technical and operational measures for ship energy efficiency. “The data collection system will equip IMO with concrete data to help it make the right decisions, as well as enhancing its credentials as the best placed and competent forum for regulating international shipping,” Mr Lim said. According to IMO, the new mandatory data collection system is intended to be the first in a three-step approach in which analysis of the data collected would provide the basis for an objective, transparent and inclusive policy debate in the MEPC. This would allow a decision to be made on whether any further measures are needed to enhance energy efficiency and address greenhouse gas emissions from international shipping. If so, proposed policy options would then be considered. 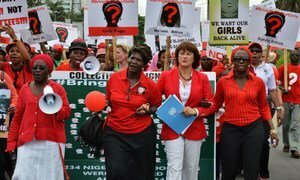 United Nations Secretary-General Ban Ki-moon today welcomed the reported release of 21 Chibok schoolgirls, who were abducted by the Boko Haram insurgent group more than two years ago, while expressing deep concern about the safety and well-being of the remaining schoolgirls and other victims still in captivity.